I have always loved to draw and build things. That’s my view of sculpture – creating lines of definition and motion in 3D. My artwork is a natural progression of some fundamental tenants of my previous career in home building. The best projects have both creative architecture and sound engineering. In the sculptural work I do those attributes manifest themselves as creativity coupled with craftsmanship. One without the other is not as effective. Raw undisciplined creativity by itself rarely produces excellence – yet tedious craftsmanship without the spark of ingenuity is boring to me. 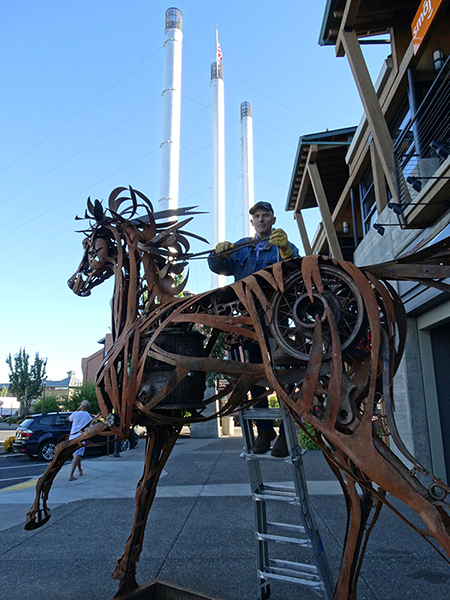 “Charlie”, the heroic sized sculpture of a stallion by Greg Congleton is made of found metal objects. I was raised on a cattle ranch in Paulina, Oregon in a family of artists and engineers. Mom’s leather tooling was legendary in the area. Dad was a skilled practical engineer and fabricator as well as cattleman. He was sort of the ”village smithy” and mom was sometimes called “the artisan of Paulina”. They met as welders in the Portland ship yards during WWII so I suppose I was destined to work in metal. My two older brothers are practicing engineers. I’m told that I am a strange mixture of artist, architect, engineer, and humorist. After college I spent 30 years in designing and building remodeling and custom homes until sculpting with bronze and steel became a full time occupation. Aside from an art correspondence course in my teens and a short sculpting workshop a few years ago I am self taught artistically. When God gifts with creativity it is sort of a curse as well as a blessing. The blessing is that it is capable of producing artwork I can become emotionally attached to and delight in. The curse is that it constantly pushes me upstream into uncharted waters where I am not so comfortable and am never afforded the luxury of feeling I have arrived.